Back in December a piece of mine about the wilderness writers who’ve inspired me called Visionaries of the Wild appeared in TGO magazine. I described seven writers in particular, six of them being ones to whom I return constantly and one a new writer who has impressed me. Of these seven, three are American (Henry David Thoreau, Aldo Leopold, Edward Abbey), two ex-pat Brits who moved to and wrote about the USA (John Muir from Scotland and Colin Fletcher from Wales), one Scottish (W.H.Murray) and one English (Robert Macfarlane). In the feature I said that I think Britain lacks a tradition of outdoor prose writing and that our outdoor writers tend to be either nature or adventure writers, few of whom present a vision of wildness. In the February issue of TGO Jim Perrin commented on this piece in his Contemplations column saying that he was “frequently brought up short by how overviews of what we generally term outdoor literature …. almost invariably ignore the riches of our own British version of that writing tradition and celebrate instead an American one”. Jim Perrin goes on to list British writers he thinks should be considered - George Borrow, Richard Jeffries, Edward Thomas, Seton Gordon, W.H. Murray, Robert Lloyd Praeger, Harry Griffin, Tom Weir, Bill Condry, Jim Crumley, Hamish Brown, Nan Shepherd and John Wyatt - and says “before we reach judgements on outdoor literature, we need to make sure we’re well-versed in all those writers and a whole host more”. Now I was not making judgements nor commenting on the whole range of outdoor literature but my views were based on having read all the writers Jim mentioned bar one (Jaeger, of whom I had never heard), plus many more (what about Gavin Maxwell, Showell Styles, John Hillaby? ), and not finding them as inspiring on wilderness and landscape as the writers I mentioned (except for W.H.Murray, who I had included anyway). This is not to say that I don’t think these writers are good. Some are excellent. But none present a vision of wilderness and landscape in a big, over-arching sense in the way the writers that inspire me do. Most don’t even try to do this. Seton Gordon for example is a superb writer on Scottish nature, especially birds, and occasionally conjures up wonderful descriptions of Scottish wild land but there’s nothing in his works that I’ve read to compare with Muir or Abbey. Hamish Brown’s Hamish’s Mountain Walk is the best book about a long distance walk in Britain that I know but the author doesn’t have, or try to have, the expansive reach of Colin Fletcher in The Man Who Walked Through Time. Jim mentions the books that have an honoured place on his bookshelf – John Wyatt’s The Shining Levels, Thoreau’s Walden. Now Walden I have no quarrel with but much as I like The Shining Levels it’s not a book I return to often or would place on a level with the other Abbey or Fletcher or Muir (who Jim dislikes intensely). At the end of his piece Jim touches on Robert Macfarlane’s The Wild Places, though he doesn’t mention it by name, saying that I praised it for its “comforting notion that we can always find wild places in the most surprising places”. Jim says he finds that argument a little complacent and asks if our children will be able to find such places given the pace of destruction of the wild going on. Here I think Jim has misunderstood what I and Robert Macfarlane are saying. The “comforting notion” is not about finding the wild in surprising places. It’s about the fact that the wild will return, that, to quote Macfarlane, “the ivy will snake back and unrig our flats and terraces”. The difference in views is a matter of scale. Jim is thinking on a short, human scale, the next year, decade, generation. Robert Macfarlane is thinking much longer, into the distant future, and in the knowledge that the damage we do now is only a tiny blip in the story of the planet. Not that that’s a reason for doing nothing, for accepting destruction. We live in Jim Perrin’s timescale. Protecting the wilds we have left is for our own sakes as well as our children’s. Jim finishes by saying that “the task of the outdoor writer isn’t just to celebrate wild land but to “protect it passionately, and make us aware of every threat”. I agree and that is something I have always tried to do since I began writing, perhaps not forcefully enough – but then it is all too easy to become preachy and off-putting, shouting loudly but not being heard. Of course writing in defence of wild land isn’t a new task for outdoor writers – it is a main thrust of the work of Aldo Leopold, Edward Abbey and, above all, John Muir, the most effective writer in defence of wild land ever. 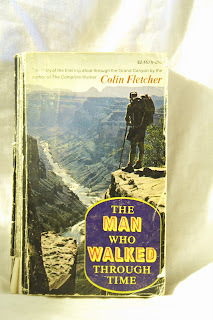 The image shows my battered copy of Colin Fletcher’s The Man Who Walked Through Time. It has an honoured place on my book shelves. I suppose in the end comparisons are pretty pointless. I concur with both your list and Jim's. Praeger is terrific - try "The Way We Went". And talking of writers on Ireland, how about Tim Robinson? Roger Deakin and Kathleen Jamie are also writers who have impressed me hugely - to name but two. And I would put Perrin himself up there. Also - sometimes that "big, over-arching sense" and "expansive reach" in the more vociferous authors can tip into verbosity - for example, much as I admire Muir, for what he achieved and for much of what he wrote, there are big chunks of his books that are over-written and more or less unreadable. Yes, it does all come down to personal preference. And I'm not knocking any of these writers. Read them all! I shall look out for Praeger. Tim Robinson is another writer I hadn't heard about before. I have Roger Deakins Wildwood on my shelf of books waiting to be read. He features in The Wild Places as a mentor of Robert Macfarlane. I certainly agree that not everything Muir wrote is worth reading. I gave up with a couple of his books. Often he wrote to promote his campaigning and had no real desire to do so. I agree Jim Perrin is certainly up there with the others. I wish he would write a more expansive book on landscapes. Absolutely agree with you that JP's big landscape book has yet to be written - and what a tragedy if it never comes to fruition.His tgo pieces, though often brilliant, are of necessity written to a journalistic deadline and frustratingly short. "Travels With The Flea" was fab - but again a collection of newspaper/journal pieces on the whole. Now he's away from the climbing stuff I'd love him to do more of a Macfarlane. Got to agree with some of Jim's sentiments regarding Muir - I find Muir difficulty to take seriously sometimes, as it seems everything he sees is the latest most wonderful thing he's ever seen - until he sees the next thing, of course. I love optimistic viewpoints but there has to be a limit if credibility is to be maintained! I completely agree with you on Fletcher though. Thousand Mile Summer is unsurpassable, as Muir might say, at least, until it's surpassed! oh... and I have to say I love the cover of your gnarled Man Who Walked Through Time tome. If I'm not mistaken it shows Smearsett Scar viewed from somewhere just above Malham Cove - a difficult landscape to squeeze into the frame, but do-able I'm sure! Solitary walker, no one has written a good "big landscape" book about Britain yet, that was one of the points of my original article. The Wild Places probably comes closest but could do with a more general overview and more on protecting wild land. John, I did say in the TGO article that not all of Muir is worth reading! It's not his over-exuberance that I find hard though - I can cope with that - but the dull scientific plodding of Studies in the Sierra (and geology can be exciting to read about, just look at Richard Fortey's superb The Earth) and some of the tourist aimed stuff in Our National Parks. But Jim seems to really dislike him as a writer and a person, which puzzled me given all he achieved. I like him enough to forgive the bits of bad and boring writing. At his best Muir is superb though - an example being his description of the first ascent of Mount Ritter in The Mountains of California. I agree The Thousand-Mile Summer is unsurpassed, except by The Man Who Walked Through Time, which is even better! And Fletcher's best book, which is why my copy is somewhat battered. I keep going back to it. However a few years ago I picked up an original 1968 hardback edition with two sets of photos in it that don't appear in the paperback. That's my back-up copy! Treated myself to a signed first edition of Thousand Mile Summer... just as well as I lent out my paperback copy just before the great man died, and it hasn't found its way home yet! I find Muir difficult reading at times, but as you say, you've just got to admire the man and his acheivements. His life story (well worth reading the Turner biography that is published in UK by Canongate) has almost the quality of a myth. My favoured writer on the outdoors is Aldo Leopold; I turn often to many of the passages in Sand County Almanac; also I enjoy Thoreau. I don't think many UK writers come close to these: for Thoreau and Leopold, beautiful description of nature is never enough - every word in their writing is intended to point towards some truth, which gives their writing a powerful quality. Of the UK writers mentioned, I did enjoy Nan Shepherd's The Living Mountain. Personally I found 'The Wild Places' to be a bit overwritten, and you could sort of predict where it was going after a few chapters, though MacFarlane seems likable. I've not yet read any Fletcher - will have to go to the library following your comments. I also enjoy the more conventional stories of long journeys, such as those by Nick Crane - Clear Waters Rising was in my opinion the best book about walking for quite a few years. Paul, the Turner biography is good. Even better is The Pathless Way: John Muir and the American Wilderness by Michael P.Cohen, which is much more analytical. It looks in detail at his different writing styles and how his points of view changed. A Sand County Almanac is one of the books I return to often, hence its place in my original feature. I enjoyed Clear Waters Rising though I felt it faded towards the end, when it seemed the author became tired of the walk and just wanted to finish. My favourite accounts of long distance walks are the two by Colin Fletcher - The Thousand-Mile Summer and The Man Who Walked Through Time - followed by Hamish Brown's Hamish's Mountain Walk and John Hillaby's Journey Through Britain (the book that originally inspired me to start long distance walking). As you enjoy stories of long journeys may I ask if you've read any of mine? Hey, Chris... that John Hillaby book was my very first inspiration too! Paul, I agree about Thoreau - wonderful - I've yet to read Leopold and am looking forward to it. Much as I enjoyed Clear Waters Rising, I thought it was far too long and under-edited: some of the historical background bits seemed to have been added-on not very seamlessly. Nan Shepherd - wow, yes, that is one of my very favourite books. Don't agree with the Macfarlane being overwritten, though... love to death both of his books! I love Muir's 'First Summer in the Sierra' and was thrilled when hiking the AT to come to a pass through which Muir is rumoured to have travelled on his famous journey to the Gulf. Thoreau I admire for his ethics and some of his writing, though I am afraid I agree with Abbey (the greatest outdoor writer ever in my opinion), about his pedantic, prudish, pontificatory (?) and priggish tendencies. I require a healthy portion of humour in my nature writing, lest it descend into sanctimonious or quasi-biblical preachiness. I reckon Thoreau's heart was in the right place, he just needed a good, er...girlfriend to share his hut and his plot of beans in the suburbs. Mountaingoat, it is exciting walking in the footsteps of John Muir. I think "First Summer in the Sierra" is his best book. I agree with you (and Abbey) on Thoreau, he can be a little too po-faced and does lack a sense of humour. His best writing is superb though. Abbey the greatest outdoor writer ever? Maybe. Have you read Colin Fletcher? I reckon he's as good (and he had a sense of humour).